We’re bringing a little touch of the wild to the Societies’ Convention in London in January 2014 – and by spotting the animals on our safari you can be in with a chance to win fabulous prizes worth over £1200! Six companies are stopping-off points on the safari, and on each stand you’ll find a cuddly toy animal. Note them all down and drop your entry into the box on the Folio Albums stand (K95-8) to be in with a chance to win! Download your entry card now! Just print it out, and bring it along with you to the show. One lucky winner will bag all of these fabulous prizes, worth over £1200! Fine art portrait and wedding albums for professional photographers handmade in the UK. Cameras built to excel in speed, precision, creativity and image quality – topped off with a retro design. The UK’s leading magazine for professional photographers the world over. All the latest news, reviews, tips and techniques to boost productivity and profit. Business management software for photographers that’s really easy to use – it makes admin really simple! Focused on photography: an all-in-one software solution to make your images their best. Quality gear for photographers – UK distributors for Think Tank Photo, FLM, Green Clean, Lightech, LumiQuest and Peak Design. The FULL Societies 2014 Convention runs from 15-20 January 2014, and the Societies TRADE SHOW takes place over 3 days, from Jan 17-19, at the Hilton London Metropole Hotel, 225 Edgware Road, London, W2 1JU. This entry was posted in Competition, Event, Photographer, Photography, Show, Sling-O-Matic, Snapperstuff, SWPP, Think Tank Photo and tagged event, Folio Albums, Light Blue, Olympus, onOne Software, Professional Photographer, show, SWPP, The Societies, trade show. The countdown is on to Europe’s biggest annual photographic Convention. The Societies 2014 Convention runs from 15-20 January, and we’ll be exhibiting with the Societies Trade Show, over 3 days, from Friday Jan 17-19, at the Hilton London Metropole Hotel, 225 Edgware Road, London, W2 1JU. Registration for FREE ENTRY to the Trade Show has now been extended to 10 January 2014, after this the cost is £6. Over 100 exhibitors are preparing to show the latest products and services from the photographic industry. He added, “Many of the trade have negotiated special deals for the 2014 Trade Show. There will also be a range of free demonstrations from some of the key players within the industry, such as Adobe, The Flash Centre, onOne Software, Fujifilm…to name a few. This entry was posted in Event, FLM, Green Clean, Lightech, LumiQuest, Peak Design, Photographer, Photography, Retailer, Show, Snapperstuff, SWPP, Think Tank Photo and tagged convention, FLM, Green Clean, Lightech, LumiQuest, MindShift Gear, Peak Design, Photo, show, Snapperstuff, SWPP, Tank, The Societies, Think, Think Tank Photo, thinktankphoto, Trade. 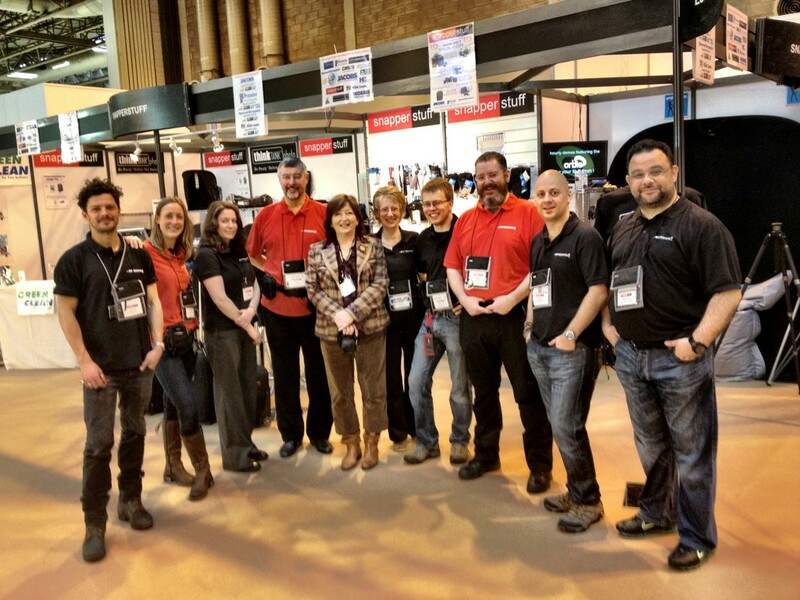 We had an amazing Focus on Imaging 2012, and it was so good to see everyone buzzing with energy and enthusiasm! We thank all of you for your ongoing support and we will continue to strive towards giving you the best service possible. This entry was posted in Enlight Photo, Event, Focus on Imaging, Frio, Green Clean, ioShutter, Orbis, Photographer, Photography, Show, Snapperstuff, Think Tank Photo and tagged Angus Thomson, Anneliese Lettner, Anthony Upton, convention, Edmond Terakopian, enlight photo, event, exhibition, Fiona Hanson, Focus, Focus on Imaging, Freia Turland, Frio, Green Clean, Helen Atkinson, ioShutter, James Madelin, James Wicks, Margaret Atkinson, Matt Pereira, Michale Crabtree, Orbis, Peter Atkinson, Photo, Sam Pearce, show, Tank, Think, Think Tank Photo.